Whitening is the most common cosmetic dental procedure in America. In fact according to the American Academy of Cosmetic Dentistry whitening procedures have increased by nearly 300% in the last 10 years. Dr. Kagihara uses two whitening systems. Opalescence power whitening is powered by a light and can be performed in about one-hour. 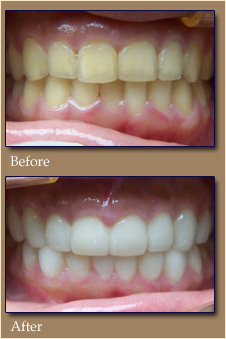 Take home gel and customized trays is a process that many patients choose to whiten their teeth over time. The Zoom! In-Office Whitening System is a revolutionary teeth whitening procedure. In just over an hour, your teeth will be dramatically whiter. The convenience of Zoom! compared to days of wearing trays and gradual whitening makes it the perfect choice for busy individuals. The Zoom! Whitening procedure is simple and painless. It begins with a short preparation to isolate your lips and gums. Our staff will then apply the proprietary Zoom! Whitening gel, which is activated by a specially designed light. Teeth typically become at least six to ten shades whiter, sometimes more. A five-minute fluoride treatment completes the procedure. You'll be amazed with the results. In most cases teeth get even whiter the first few days after the procedure. You can now have the “Hollywood smile” you have always dreamed of. For a more natural progression of whitening, Dr. Kagihara may recommend a professional-grade gel and tray whitening system. Dr. Kagihara’s customized whitening trays are molded to fit your mouth perfectly, so that the whitening solution can fill in the area around and between each tooth. The Nightwhite and Daywhite whitening gel is professional strength so you will be able to whiten rather quickly, seeing results after two-to-three applications.